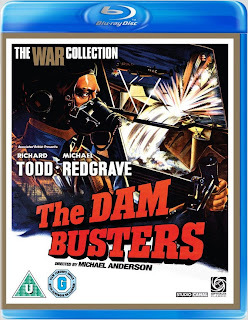 I've just re-watched two WWII movies, 633 Squadron (1964) and The Dam Busters (1955), much-loved in the UK after regular TV showings for years of Saturday nights during the 1970s and 80s. 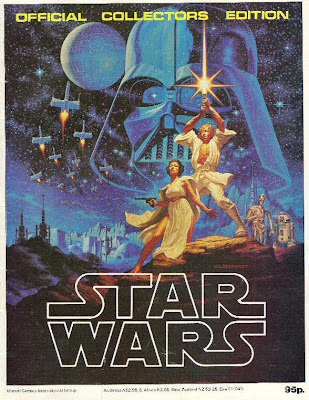 It's now an easy observation that the finales for both films provided inspiration for the climax of the first Star Wars (1977), which should really make them more popular now. But looking around in books, magazines and websites dedicated to Star Wars, there's little or no mention of them. 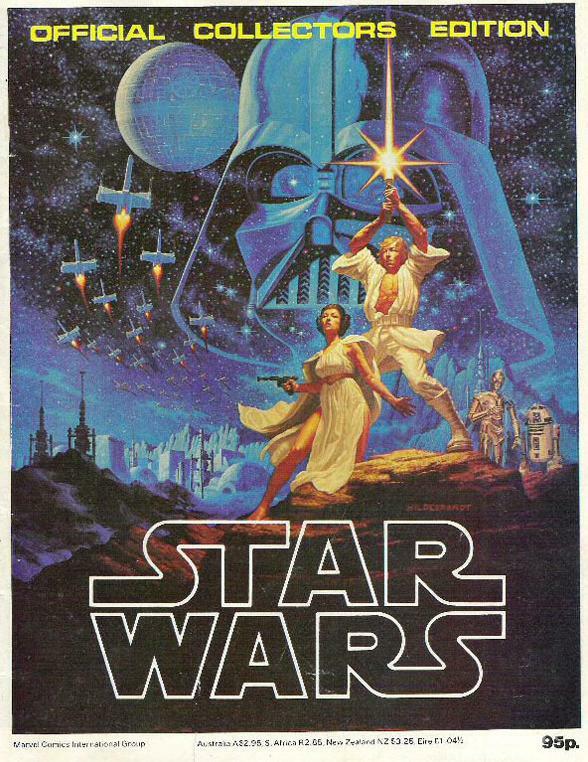 I loved Star Wars when it came out, and pounced on anything written about it at the time. 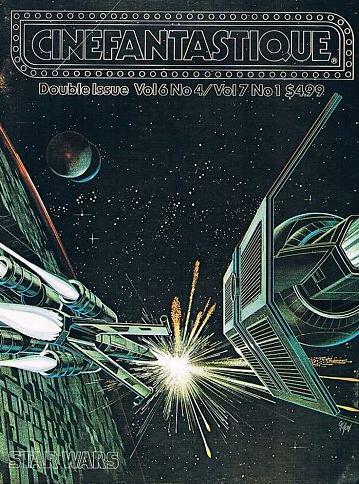 I was surprised that the 1977 Star Wars 'Official Collectors Edition' magazine started with 16 pages of acknowledged influences on the themes and designs of the first Star Wars film. There are photos from the original Flash Gordon serials, The Mark of Zorro, True Grit, Johnny Weissmuller's Tarzan and dozens more American productions, plus the robot Maria from Germany's Metropolis. I didn't realise how many films hadn't been mentioned. 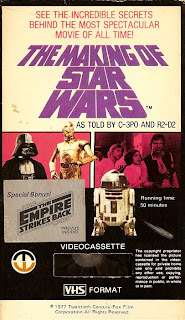 I've rewatched The Making of Star Wars ...as told by C-3PO and R2-D2 documentary (released on VHS and laserdisc, and coming soon to the Blu-ray special edition), free TV publicity for the initial movie release. It briefly shows airplane footage from a black-and-white American movie (Jet Pilot?). The voiceover is, "The adventure into which Luke Skywalker is thrust is derived from World War II dogfights as shown in Hollywood films...". My gripe now is that half the movies actually referenced for the outer space battles weren't made in Hollywood, but in Britain (as was much of Star Wars). Like the magazine, this documentary parades clips from similar American movies of the 1940s, of swashbuckling Douglas Fairbanks, swordfighting Zorro and cliffhanging Flash Gordon. 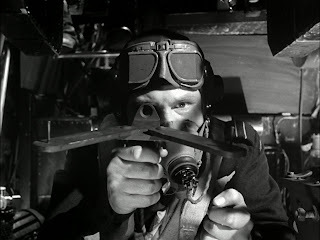 This casual mention of dogfights, often abbreviated to 'World War II footage' fails to describe an extensive echoing of scenes from a few specific movies, re-using visual composition of unique shots, their blocking, lighting, and even dialogue. While many directors would screen movies to their crew before a production to establish mood or tone, here we have other people's movies being cut up and used as moving storyboards. Not just black-and-white war movies, but big-budget, widescreen colour classics. Of course, this 'referencing' didn't happen in isolation. The Dam Busters targeting computer is made of wood. The young directors who ruled Hollywood in the 1970s, 'The Movie Brats', all came from film schools. They'd studied and dissected classic cinema, sometimes shot-by-shot, heralding an era of movie-making full of intensive homage. Spielberg used camera techniques he'd watched, famously using Hitchcock's 'reverse zoom' from Vertigo for a very different use in Jaws. 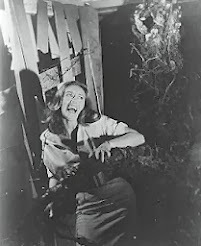 Brian De Palma would riff on Hitchcock's plots (Obsession, also derived from Vertigo), as well as camera technique. The Brats weren't above remakes, like Scorsese's Cape Fear, De Palma's Scarface and Spielberg's Always. Earlier on, George Lucas wanted to adapt Flash Gordon (previously filmed as three cliffhanger serials in 1936, 1938, 1940) but discovered the rights had already been purchased (and eventually used for De Laurentiis' 1980 movie). 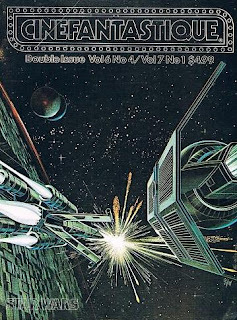 Instead, he wrote Star Wars in the same vein, exploring the same inspirations as Alex Raymond's original comic strip. But that story only explains the space fantasy setting. The extended climax of the first Star Wars was a dazzling technical and emotional achievement, key to the box-office success of the film and ensuring the birth of a franchise. Despite the assault on the Death Star being in outer space, the X-Wings and TIE fighters glide like airplanes, grouping in battle formations like WWII fighter planes. The mission is to fly into and along the Death Star trench for a remote chance at hitting a well-defended target. 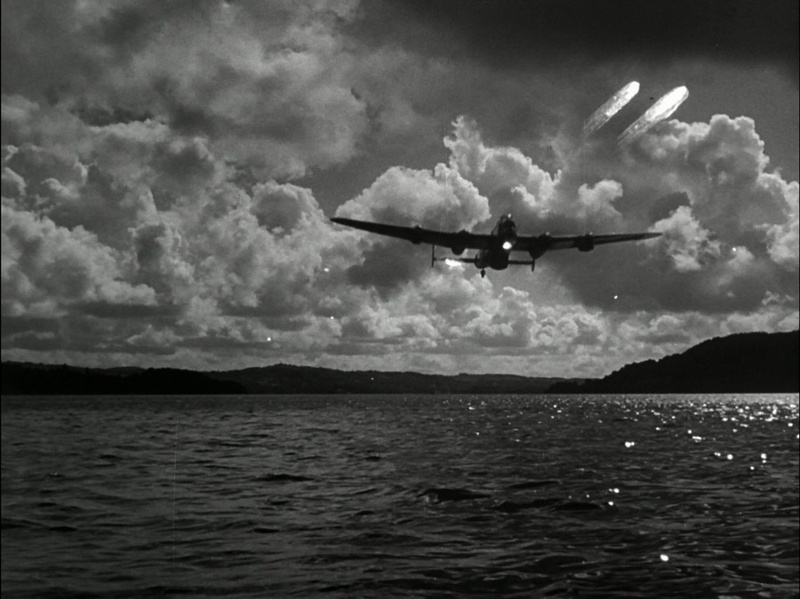 This was also the climax of The Dam Busters (1955) and 633 Squadron (1964). 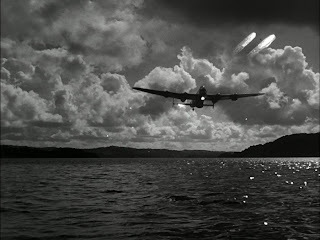 The squadrons in The Dam Busters have to fly low over a mountain reservoir to hit a specifically pinpointed weak spot on a dam (to flood enemy factories). 633 Squadron fly low along a narrow, high-sided, heavily-defended fjord to target a specialised fuel factory. Both targets are far more logical than the gaping flaw in the design of the Death Star. The suspense and excitement generated by these scenes are the reason so many elements have been re-used in the climax of Star Wars. In American Cinematographer magazine (July 1977), there's an example of a storyboard 'conversion' on page 744 - a sketch of a shot of two planes diving(which looks like it's from Tora! Tora! Tora!) shown next to the equivalent sketch of an X-wing and a TIE fighter in the same positions, same shot composition, the horizon mapped onto the edge of the Death Star. This would then be the storyboard for the visual effects department. Usually there are only few movies that get name-checks when the subject is raised, even in the weightiest books on the making of the film. 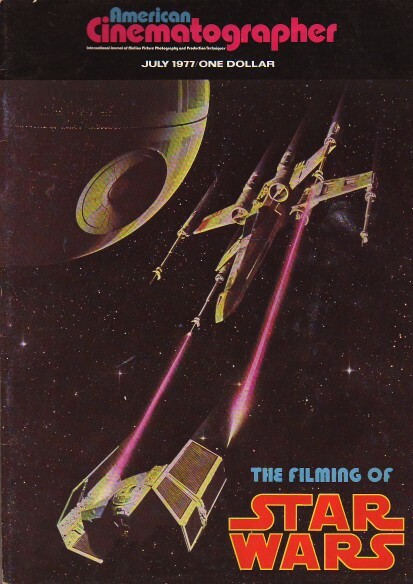 In the George Lucas Interviews (edited by Sally Kline), Lucas refers to a few of the same movies as Joe Johnston "plus about 45 other movies". To me that's a very poor tribute to the film-makers who unwittingly provided blueprints for one of the most famous scenes in movie history. Common knowledge is now that "World War II footage" was used, when it should be 'World War II movie footage'. Personally, the impression I'd always had was that they'd just used combat footage. But I hadn't realised there's more than a logistical similarity between the missions in The Dam Busters and 633 Squadron and the Death Star run. Using combat footage as technical reference material would add to the realism. Using other movies' special effects shots and set-ups is unimaginative. Now I'm not going to micro-analyse all the similarities for you, and I'm surprised no-one else has put a slew of parallel shot breakdowns of the Death Star trench scene online, with a ton of screen captures best-guessing how these films were used. (Not to mention the dialogue also lifted from The Dam Busters). It's obviously extensive, and just as innovative as it is cheeky. But I'm not going to devote any more time proving the point. The three directors of Airplane! (1980) Jim Abrahams, Jerry and David Zucker, all referred to Zero Hour! (1957) because they'd never directed a movie before. Besides spoofing the plot and the dialogue, they even looked at the film to choose camera see-ups. The difference here is that they got nervous and bought the rights to Zero Hour! in case they were later accused of plagiarism (they tell this story on the Airplane! DVD commentary track). Cinema is rife with homage, but it seems that Spielberg and Scorsese talk about their influences and 'quotes' freely and often. Quentin Tarantino energetically diverts fans back to his beloved grindhouse classics. But no-one is leading Star Wars followers to all of its major inspirations. The proof is in the referenced films themselves. I'd encourage you to watch a few in Joe Johnston's list and play spot-the-homage for yourself! If you're going to steal, steal from the best. I'm looking forward to seeing Tora! Tora! Tora! 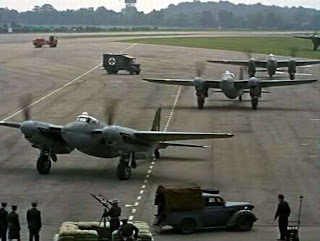 and Battle of Britain again on Blu-ray, in search of further quotations, but it was The Dam Busters and 633 Squadron that reminded me of all this. In both films, the whole story is devoted to the final mission. 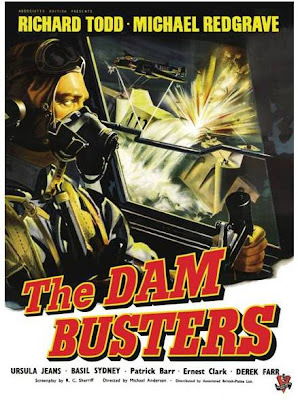 The Dam Busters aims for historical accuracy, describing inventor Barnes Wallis' own determination to persuade the military that his eccentric-looking 'bouncing bomb' could successfully be deployed. It's a story of perseverance and also a tribute to the airmen who practised for and flew the final mission. Especially those who didn't return. Of course it's not a thrill-machine like Star Wars, but a dramatic story heightened by the fact that it happened for real. 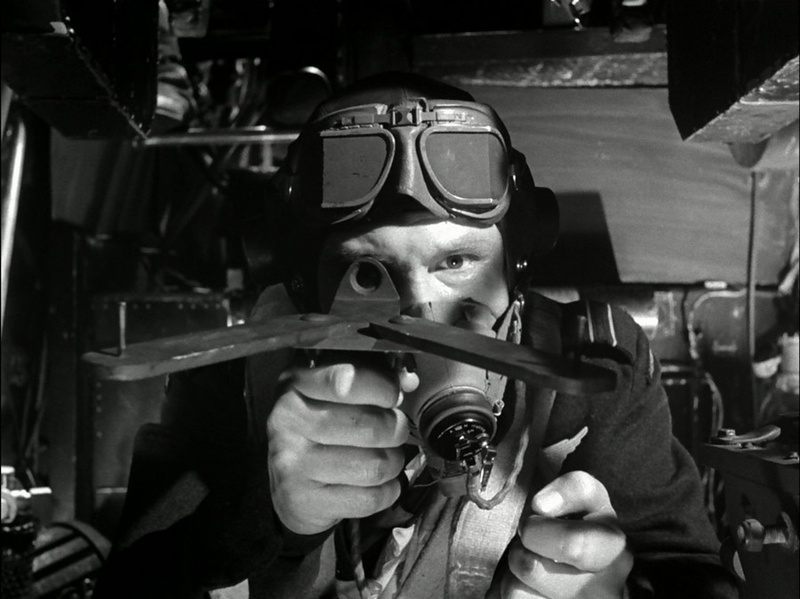 Slightly surprising that a major film of the era was made in black-and-white and aspected 1.33, but probably because it wanted to intercut actual wartime footage of the bombing test runs. 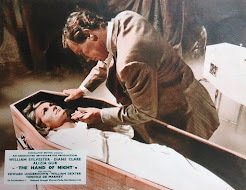 It stars Michael Redgrave (Vanessa's dad), probably better known to you from Dead Of Night (1945) and Richard Todd (Asylum, House of the Long Shadows). Fun to see a young Robert Shaw (Jaws, From Russia With Love) so early in his career. Director Michael Anderson later made Logan's Run and Orca - The Killer Whale! 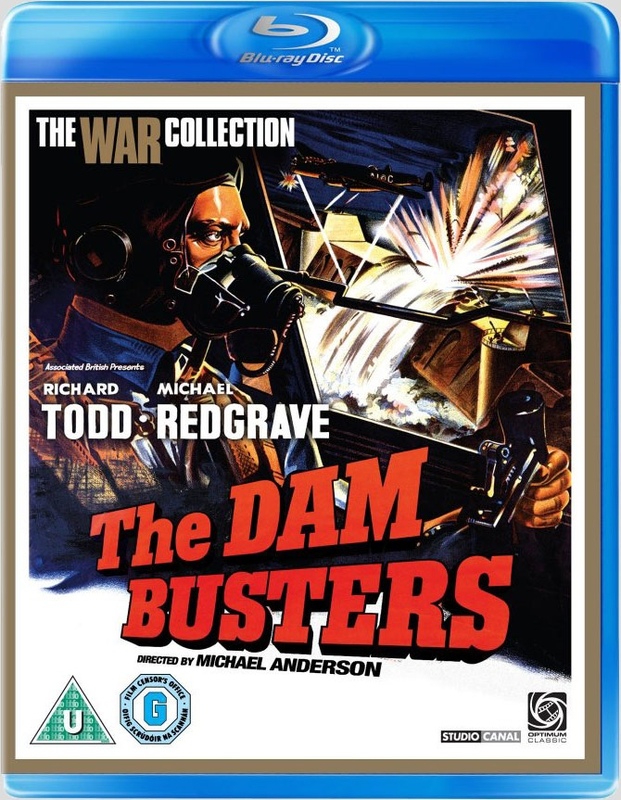 See also DVD Beaver for a thorough and informative review of The Dam Busters on Blu-ray, with their persuasive DVD/Blu comparison screenshots. 633 Squadron has a fast-paced, action-oriented story, but felt like a pumped-up remake of The Dam Busters in widescreen and colour. There's gun battles, nasty Nazis and much more aerial action. Their target, at the end of a long sea inlet (flat base of the water, high steep mountains to the sides) is as close to a natural double for the Death Star trench as you could wish for (until Firefox came along). There's less drama, more melodrama. Less emotion, more shouting. 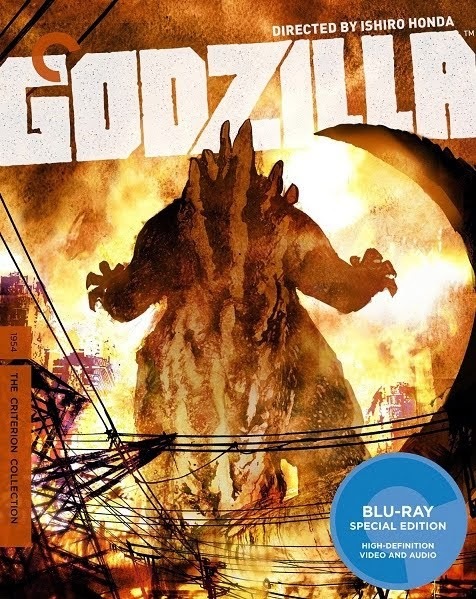 It's an exciting, easy watch, but the modelwork is unbelievably small in scale, something that barely registered when I used to watch it on a small TV. Cliff Robertson (Obsession, Spider-man) and George Chakiris (West Side Story) star. These films, Tora! Tora! Tora! (an epic reconstruction of the attack on Pearl Harbor) and Battle of Britain were all made when there were still enough operational aircraft around not to have to rely on special effects. They all have really impressive scenes of restored World War II airplanes taking off and in flight. Battle of Britain even hazardously recreated aerial dogfights between swarms of British and German planes. Finally, please check out the hairstyle of actress Ursula Jeans, who plays Barnes Wallis' wife in The Dam Busters. Nice buns!